Jennifer M. Walden. “A Drum, a Gong, and a Lion: Three Decades of Culturally Diverse Music Education in International and Canadian Schools.” Journal of Chinese Ritual, Theatre and Folklore 203 (2019.3): 35-72. Oshio Satomi. “Traditional Music and World Music in Japanese School Education.” Journal of Chinese Ritual, Theatre and Folklore 203 (2019.3): 73-110. Pan Ju-tuan. “The Transmission of Beiguan in Higher Education in Taiwan: A Case Study of the Teaching of Beiguan in the Department of Traditional Music of Taipei National University of the Arts.” Journal of Chinese Ritual, Theatre and Folklore 203 (2019.3): 111-62. Huang Ping-ying. “Knotting and Untying “Knots”: Preliminary Considerations on the “Sending off Meat Dumplings” Ritual in Lukang, Taiwan.” Journal of Chinese Ritual, Theatre and Folklore 203 (2019.3): 163-97. Hsiao Chin-ming. "Golden Hometown, Xuanguan Essence and the Way of Returning to the Original Source: An Exploration of the Name, Teachings and Practice Methods of the Jintang Sect of Zhaijiao." Journal of Chinese Ritual, Theatre and Folklore 202 (2018.12): 1-58. Lin Ho-yi. "The Transmission, Transformation and Innovation of Commoners’ Aesthetics: On the Scripts of a Professional Play Narrator in Singapore, Chen Meiying." Journal of Chinese Ritual, Theatre and Folklore 202 (2018.12): 59-131. Lee Tien-yin. "Southern Qi and Northern Ma, a Case Study of Commercial Competition as a Strategy of Theatrical Performance in the Golden Period of Peking Opera, 1917-1938." Journal of Chinese Ritual, Theatre and Folklore 202 (2018.12): 133-79. Huang Wen-chu. "In Search of Hometown Accent Abroad: Investigation of Hokkien Ballads and Their Local Memory in Penang." 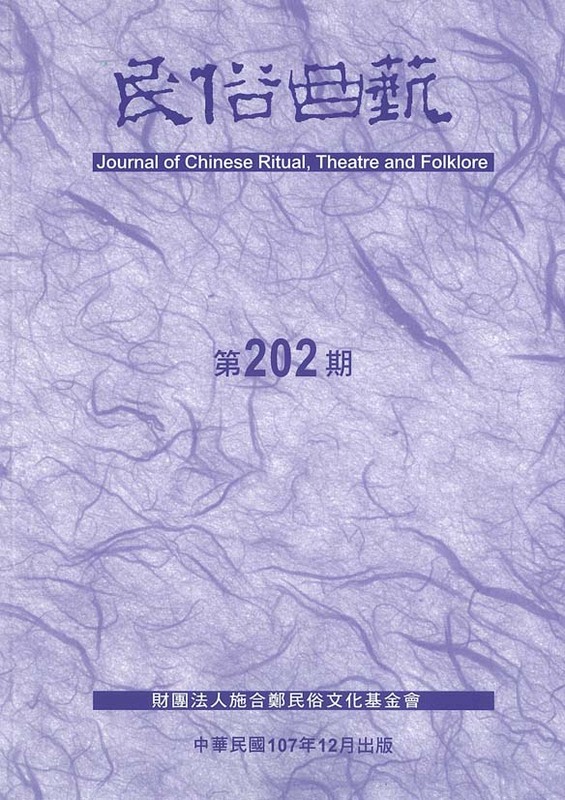 Journal of Chinese Ritual, Theatre and Folklore 202 (2018.12): 181-219. Chao Chi-fang. “Folklore, Performing Arts and Cultural Heritage: Contemporary Ritual Practices of Taketomi Island in Okinawa.” Journal of Chinese Ritual, Theatre and Folklore 201 (2018.9): 25-63. Lui Wing Sing. “The Designation of Intangible Cultural Heritage of Yulan Ghost Festival and the Re-construction of Ethnic Chaozhou Communities in Hong Kong.” Journal of Chinese Ritual, Theatre and Folklore 201 (2018.9): 65-100. Qu Xiaoyu and Peng Liansheng. “Deities Reside Within: Negotiation of the Spatial Concept in the Summon Ritual Script of the Rural Jiao in South Zhejiang.” Journal of Chinese Ritual, Theatre and Folklore 201 (2018.9): 101-67. Shyu Mei-ling. “A Study of the Folk Song Collection and the Context of the Musical Records of Hsu Shih, Being Based upon His Work Symphonic Folk Songs of Taiwan.” Journal of Chinese Ritual, Theatre and Folklore 201 (2018.9): 169-225. Lo Su-mei. “'Tradition' or 'Creation'? Women’s Organization Militepuray in Between the Practices of ‘Atolan Amis Rituals and Norms of Gender Hierarchy.” Journal of Chinese Ritual, Theatre and Folklore 200 (2018.6): 25-101. Yeh Shu-ling. “The Image of Mother Mary and Intangible Heritage: An Analysis Based on Studies of Such Ritual Activities as 'Love Feast' and 'Assumption of the Blessed Mother Mary' Celebrated by the Urban Amis.” Journal of Chinese Ritual, Theatre and Folklore 200 (2018.6): 103-36. Lin Fang-chen. “Safeguarding or Restraining Cultural Heritage? Cultural Practice and Agency of Creativity in the Amis Music Festival.” Journal of Chinese Ritual, Theatre and Folklore 200 (2018.6): 137-200. Chen Yongchao. “A Survey of Taimu Cult and Ritual Art in Shangfang Mountain, Suzhou.” Journal of Chinese Ritual, Theatre and Folklore 200 (2018.6): 201-55. Special Issue on "City Space, Material Culture and Theatrical Development"
© Shih Ho-cheng Folk Culture Foundation 2012 財團法人施合鄭民俗文化基金會版權所有. 圖片視窗主題. 技術提供：Blogger.